The Arctic cloud summer experiment (ACSE) is part of the SWERUS-C3 expedition. We have now rounded Severnaya Zemlya and entered the Laptev Sea; right now we are "balancing" on the outer edge of the shelf. The route from the Kara Sea to here took us through some pretty sturdy ice and so we lost some time, which we are now trying to catch up on. Pic 1. 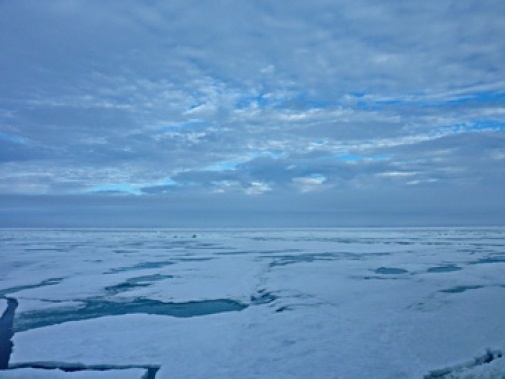 Sea ice, Arctic Ocean. Pic 2. Meteorology instruments, onboard icebreaker Oden. 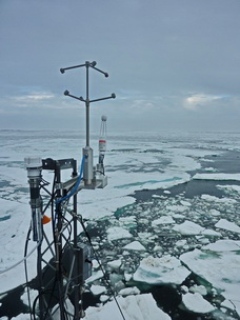 The first "research station" was two days ago, still within the ice (Pic 1); although the meteorological research is continuously ongoing, those that take water samples from the ocean or sediment samples from the ocean floor needs the icebreaker to stop and lie still while they are doing this. This also allows our team to use the lift to get up in our mast, to check on our instruments (Pic 2). Pic 3. Unusually persistent very thick fog. 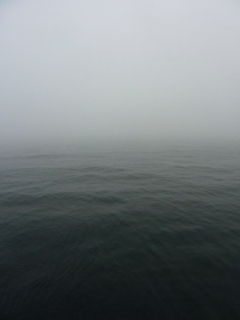 However, since a while now we are in open water again and today we have had an unusually persistent very thick fog (Pic 3) all day. Life on board is now starting be routine and it is becoming difficult to keep track of what day it is; they are all the same and still very different. All is really well, we eat and work to much and sleep to little.